Friday, April 6 at 9:50 a.m. The night closures and work scheduled Saturday, April 7 and Sunday, April 8 have been cancelled due to predictions of inclement weather. Weather permitting, work and closures will resume 10 p.m. Monday, April 9. 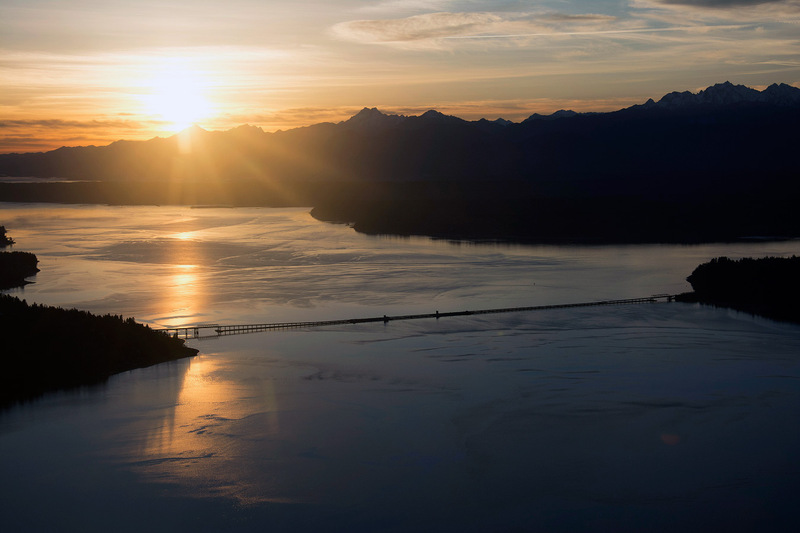 It is that time of year of again: work on the Hood Canal Bridge is returning. Work began last year to rehabilitate the drawspan's mechanical components. This is no easy task, as it is the longest saltwater floating bridge in the world at 7,867 feet. Ongoing maintenance is necessary to keep the bridge operationally sound for travelers and marine vessels who rely on Hood Canal and the bridge as an economic, military, transportation and tourist lifeline. Bridge crews do preventative maintenance on the bridge weekly to maintain the operability of the bridge, which sits in harsh and corrosive salt water by way of floating pontoons. The water depth beneath those pontoons reaches almost 300 feet. In 2009 when the east half of the bridge was replaced, many of the mechanical parts were exchanged to provide reliable operations around the clock to both marine and vehicle traffic. Due to the uniqueness of this bridge, work on it is never over, but we do our best to maintain traffic flow while bridge work is underway. Fine-tuning the alignment of the guide rollers in summer 2017 resulted in better alignment of the drawspan of the bridge. 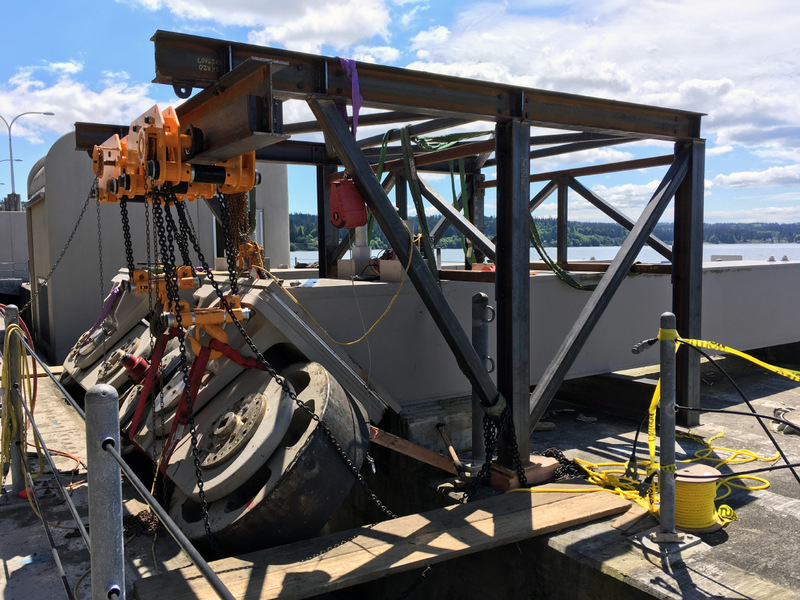 In 2017, we undertook the exacting process of realigning the Hood Canal Bridge's guide rollers. The guide rollers keep the drawspan in alignment as it opens to allow vessels to pass through. This decreases the power consumption in operating the bridge and decreases wear and tear on the drive gears and motors. We also replaced worn hydraulics hoses that circulate hydraulic fluid to mechanical equipment that operate the bridge. This minimizes the risk of hydraulic fluid leakage. What work is happening this year? From April through this fall, crews will perform "part two" of this project. First, we will verify the drawspan's alignment by making minor, final adjustments, and then we will replace the mechanical components that operate it. Crews will exchange the drawspan's lower gearboxes, rehabilitate the upper gearboxes and replace the hydraulic fluid on the west half of the bridge. Much of the work must occur during the night slack tides when there is little water movement and light winds. Whenever possible, we limit this work to overnight hours. Wheel alignment verification, requiring five intermittent nighttime closures between Wednesday night April 4 and early Wednesday morning, April 11. Next, hydraulic fluid will be replaced and the west end gearboxes will be removed. This is expected to take up to three weeks. Mariners should note that replacing the gearboxes will restrict drawspan openings from a full 600-foot span opening to a half 300-foot span opening. This summer there will be up to three nighttime closures for testing of the components. Once that's done, we can begin replacing gear boxes on the east half of the bridge. Final testing will be done in the fall once the final gear boxes are in place. This could require more intermittent overnight traffic closures. In early April travelers can expect up to five intermittent night closures. Crews will occasionally open the bridge to traffic to ease congestion as work allows. All closures will begin at 10 p.m. and last until 4 a.m. each weekday beginning Wednesday, April 4 through Tuesday, April 10. Night closures and work scheduled Saturday, April 8 and Sunday, April 8 have been cancelled due to predictions of inclement weather. Emergency response vehicles will be allowed through as quickly as possible. Other such night closures will be scheduled through the summer and will be announced as they approach. What about additional marine closures? Federal law gives boats the right-of-way over vehicles when bridges block the path of marine traffic. The rule does not apply to commercial, U.S. Navy or other Department of Defense vessels. Check our Hood Canal Bridge website. Sign up for our email/text alerts. To subscribe to Hood Canal Bridge openings text messages, send a text to the number 468311 with the words "wsdot hood." To unsubscribe, send a text message to the same number with the words "wsdot stop." We will also use highway radio and signage to alert travelers of closures. We know it's always a challenge when we close highways and we appreciate your patience as we get this important work done. 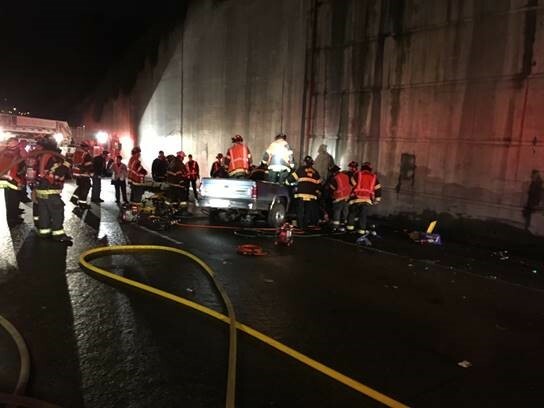 The Wednesday morning commute on northbound I-5 in downtown Seattle began with scenes of twisted metal and emergency vehicles responding to a collision in one of our work zones. This is yet another reminder of the risks our crews take on the job each day, and the responsibility we all have to stay focused and take the wheel without impairment. Contractor construction crews were finishing concrete repair work on the freeway near Mercer Street when a driver entered the work zone and collided with a construction truck. The collision totaled both vehicles and trapped the driver. The scene on northbound I-5 near Mercer Street in Seattle Wednesday morning after a vehicle rear-ended a construction vehicle in a closed work zone. 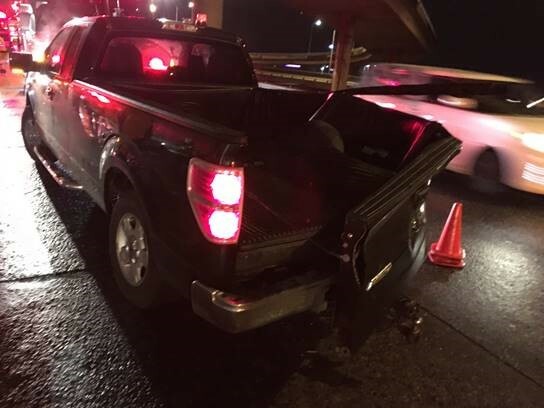 The collision left two construction workers who were in a construction truck with minor injuries while medics took the driver of the pickup to the hospital. The Washington State Patrol is investigating the collision as a possible DUI. Three right lanes of northbound I-5 were blocked for several hours, causing a 3-mile backup during the early morning commute. All lanes were open by 5:10 a.m.
Two contract construction workers were injured with a vehicle ran into their truck inside a work zone Wednesday morning. The people who work on the highway deserve to get home safely each day. That means that those behind the wheel need to slow down and pay attention. The timing of this crash is particularly poignant, because we're just days away from April and our Work Zone Safety Awareness month. This is a time we will remember workers who lost their lives on the job in work zone-related activities and remind the community of how to keep everyone safe in and around our work zones. Please remember to slow down and be alert whenever traveling near a work zone – lives may depend on it. Springtime in the Pacific Northwest conjures up images of brilliant cherry blossoms, daffodils and tulips in bloom. For construction crews building new bridges and replacing the original roadway on Interstate 5 in Tacoma, springtime is ushering in new highway alignments, fresh concrete, and the promise that two of four I-5 projects are in the homestretch. 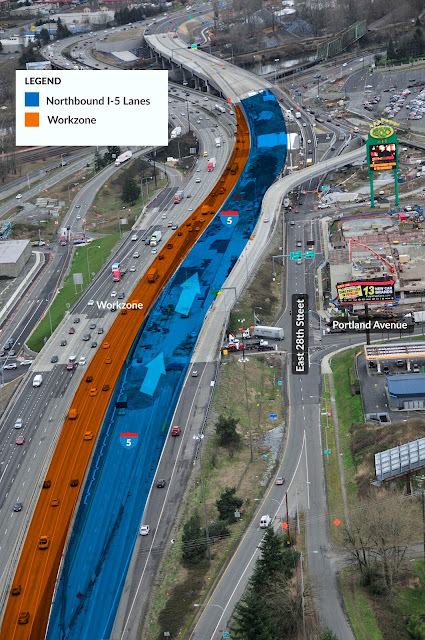 Starting as early as the last week of March, the eastbound SR 16 ramp to northbound I-5 will be reduced to a single lane to accommodate a workzone for contractor crews finishing the I-5 M Street to Portland Avenue HOV project. This lane reduction has caused delays in the past, and fortunately, this will be the last time we have to implement this lane configuration on this project. To help eastbound SR 16 motorists bypass some of the backups getting onto northbound I-5, we encourage people to try an alternate route that uses SR 7. More information about this route is available on our YouTube video below. No April fooling on this - the temporary southbound I-5 collector/distributor (c/d) through downtown Tacoma is really going away. Weather permitting, in early April, crews will remove over a mile of barrier from southbound I-5, rejoining all the southbound lanes. Overnight drivers will encounter lane closures while crews remove and reposition the barrier. Once all lanes of southbound I-5 reopen, drivers will be on a brand new roadway surface, heralding a big milestone in this project and opening the door to one of the final phases of construction in this project - completing the new McKinley Way/D Street overpass. In a separate project a little further south, another traffic shift will occur this spring at the interchange of I-5 and SR 16. Design-build contactor Skanska will move the three through-lanes of southbound I-5 to the left, creating a condition where both northbound and southbound I-5 will be closer to each other and separated by barrier. This traffic shift creates a new workzone so crews can begin demolishing and rebuilding southbound I-5. We will announce the dates of this traffic shift as soon as they become available. All winter, crews have been rebuilding the roadway alignment on northbound I-5 between Portland Avenue and the Puyallup River so that it aligns up with the new northbound I-5 Puyallup River Bridge. If weather cooperates, in May crews hope to move all northbound I-5 traffic onto the new bridge. When does the construction in Tacoma end? One last project on I-5 will begin in 2019 and end around 2021. In that project, crews will build a new, parallel southbound I-5 bridge over the Puyallup River next to the new northbound bridge and demolish the two old bridges. For the latest on overnight lane and ramp closures, visit www.tacomatraffic.com.